Lots of Thanks and Practice at DD on 4/16 !!! Hi Champs!!! I am so proud and privileged to be able to coach this group. Many thanks to Coach Aubree for running a great State meet, the best I have ever attended. Thanks to Ginger for putting on a super banquet. Thanks to Tam for running the check in desk. Thanks to all of you who timed and volunteered your time. Thanks to Roxy my awesome wife and thanks to Karen for putting all those relays together. Lastly thanks to the many swimmers from Club Sport and the Starks for always joining us at this meet!!! 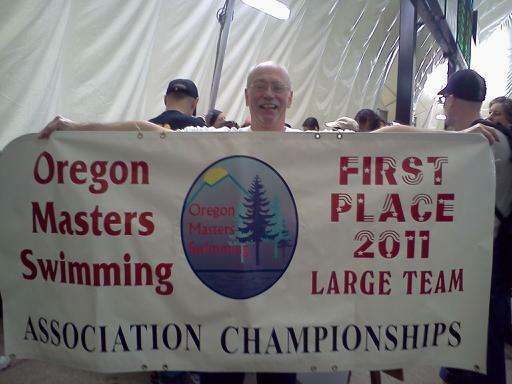 Even if you didn't swim in the meet you are a part of Oregon Reign Masters State Champs 2011 be proud. We had many great swims at the meet. Some of note: Brad B broke some breaststroke records in his first meet back since college. Speaking of firsts, Suzanne M, Sandra M, Pat M, Lynn T, Katy P, Teri C all swam their first meets and did fantastic. This is why I love to do what I do, these swimmers found their inner athlete this last weekend and it was inspiring and emotional for me to watch. Great Job!! Next Saturday will be at DD Pool (see above for details). A picture is worth a thousand words laps... Congratulations ORM !! OMS is proud to present Gary Hall Jr. as our featured speaker at our Annual Awards Banquet at the 2011 Oregon Masters Association Championship Meet! Gary is a 10 time Olympic Medal winner spanning 3 Olympic Games. He competed in 50 Free, 100 Free, 400 Free Relay and 400 Medley relay, winning 5 Gold, 3 Silver and 2 Bronze medals. He also won the Humanitarian USA Swimming Award in 2004 for his involvement with many children’s organizations and for his work with his own Diabetes Foundation. 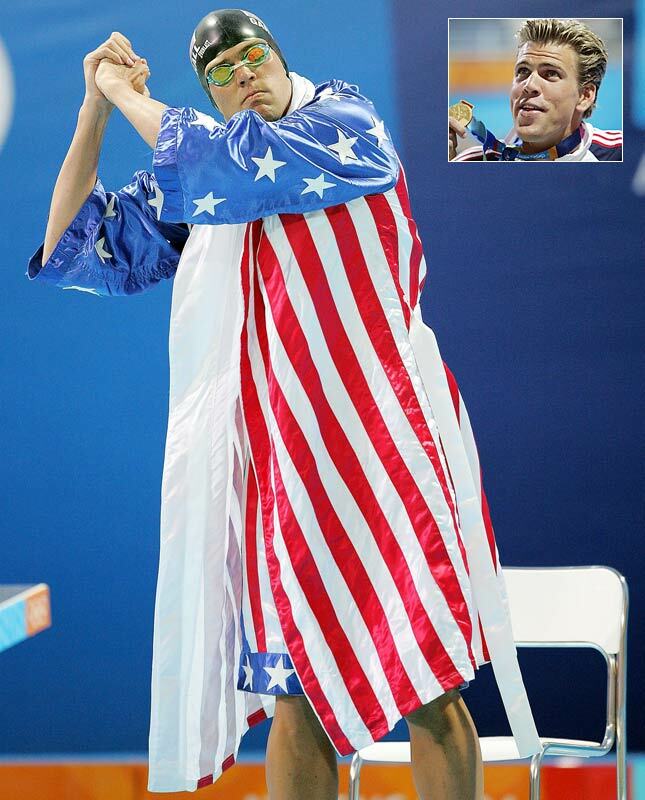 Known as a very outspoken swimmer he added a much needed flair to our sport of swimming. Best known for wearing his “Rocky” like robe and boxing shorts to many of his big swims, Gary currently lives in Seattle with his wife and two children. Don’t miss out on this chance to hear Gary speak and answer questions. The banquet will be Saturday night at 6pm on the Mt. Hood CC campus a short walk from the pool. Maps will be provided at check in. Hi All, first of all Practice at DD in ON tonight at 7:30pm. Practice is canceled at Mt. Hood tomorrow morning at 5:30am since it will be so cold and they are closed. Practice normal as rescheduled at DD split formats Sat and Sun. I am ordering Caps and Tshirts for this season next week, we are going all black in caps and long sleeve tshirts with logo. We can order white caps in June for summer. Black seems to be overwhelming favor of all. Shirts we did white last time so black this time. If you want a Parka as well we can do that too. I need this to be prepaid this year as I always seem to come up short in collecting. This is cash or check made out to JD Pence. I need to know how many you want for caps and SIZE for long sleeve tshirt. Please email me ASAP and will have three collection people Myself, Roxy and Lynn Thompson. Please give them a check made out to JD Pence or Cash. They will relay to me. For Parkas just contact me directly they are $140ish. Now we need to step up for volunteers for these two meets we are hosting gang and let me or Aubree know ASAP if your not swimming we need you to help and bring a friend or family member to help. If your swimming bring a volunteer please and let us know by Wed of next week for Blast meet. (March 13th Sunday) By March 10th for Assoc meet which is April 1-3rd. Many of our swimmers are up for awards at this years banquet at Assoc. Meet so try and make it. Gary Hall Jr 3 time Olympian Swimmer will be guest speaker.!! Lastly again we are defending State Champs so lets make a push to swim in the meet. We are hosting two masters meets in the near future and we need lots of volunteers. The first meet is the Pre-Association Blast Yards Meeton Sunday, March 13th. This meet should run about 4hrs; short, sweet and the first SCY masters meet to be held inside the dome!! The big meet we are hosting this year is the OMS Association Championships April 1st-3rd. This will be the first time that Reign has hosted the Association Championships and it should be a great event. Full meet info for both meets is listed below. Dennis and I are looking for volunteers to fill the following positions and asking for donations to our hospitality room. I know most of you will be swimming in both meets; please volunteer whatever time you can. Talk up the meets to family and friends; you can‘t get any closer to the action then a timers chair! If this is your first meet, or your first meet in a while, no better way to learn the masters meet ropes then to volunteer. Take a look below, and if something strikes your fancy, email me back what you would like to do and when you are available and I will add you to my volunteer list! Please be clear as to which meet and days you are volunteering for. Thanks to you all in advance. Swim fast! Marshals watch the warm-up/warm-down area to be sure people are not diving when they are not supposed to, help clear lanes for starts and after warm-ups and breaks so competition can begin. Plan to arrive arrive at least 10 minutes before warm-up begins on the day(s) you are to marshal. Clean Up (Sunday for both meets) Misc. Our hospitality room is one of the best!! I will be providing drinks (water, soda, coffee, etc) and some other large items. Bring whatever you like. Remember, this is mostly for the officials and our own volunteers; snacks, finger foods, tasty summer treats, etc. If making a hospitality donation, let me know what you are planning to bring and to which meet so that I can plan ahead for extra goodies if needed. Here is a link for on-line swimmer registration and meet information including order of events for the March 13th Pre-Association Blast Yard Meet at Mt Hood Aquatics Center. The deadline to signup is February 25th.